Passenger traffic at Dubai International (DXB) surpassed 43 million in the first half of 2017, according to the latest traffic report issued by operator Dubai Airports. DXB handled 43,054,268 passengers during the first six months of the year, up 6.3 percent compared to the corresponding period in 2016 when the airport welcomed 40,507,251 passengers. Monthly passenger traffic in June totalled 6,084,674 compared to 5,857,503 in June 2016, marking a rise of 3.9 percent. The relatively modest growth was the outcome of the Holy Month of Ramadan falling in June, a traditionally slow period for travel. During the first six months of the year, the top source markets in terms of total passenger volumes were India (5,943,359), Saudi Arabia (3,108,492), the UK (3,064,172), Pakistan (2,207,497) and the US (1,561,559). In terms of percentage growth, key source markets for the period were South America (36.4 percent), Eastern Europe (28.7 percent) and Asia (18.7 percent). Top cities by passenger volumes included London (1.89 million passengers), Mumbai (1.21 million), Bangkok (1.04 million) and New Delhi (1.02 million). The average number of passengers per flight during the first half was 218, up 6.9 percent compared to 204 during the same period in 2016. Air cargo volumes also nudged up during the first half of 2017, exceeding 1.3 million tonnes, up 1.6 percent compared to the 1.28 million tonnes handled during the same period in 2016. 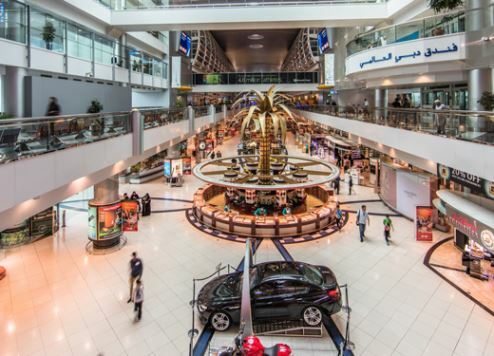 “We are pleased with the growth in the first half, and with the rush of travellers expected to hit [its] peak at the end of school holidays later next month, we are looking forward to another quarter of positive growth,” said Paul Griffiths, CEO of Dubai Airports.